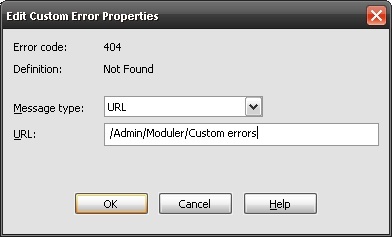 This guide shows you how to handle page not found (404) errors in Content Studio and how to configure a custom page that displays an error message. Handling 404 errors on a Content Studio site requires editing settings in both Content Studio and Internet Information Services (IIS). Log in to Content Studio admin. For example: in Admin/Moduler create category Custom errors. Right click -> New Document. This page will be displayed when 404 error occurs. Right click the newly created category (Custom errors), check use start document and set the id of the new document in the box. Right click the site root, click properties. Under advanced settings and actions, click settings. Find site.DocNotFoundId. 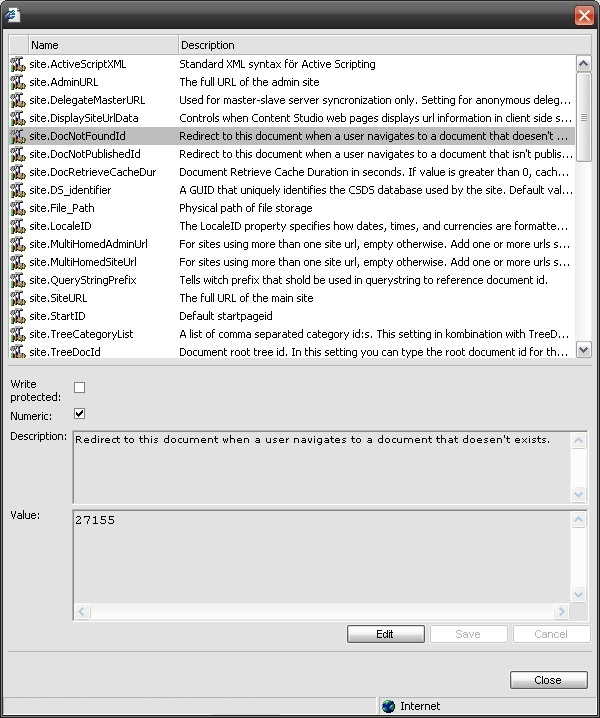 Click Edit and enter the id of the newly created document. Click Save. Go to Control Panel/Administration tools/. Right click appropriate web site (under web sites), click properties. Click the Custom Errors tab, locate HTTP error 404 and click Edit. Enter path to the category created in the previous section. 404 errors will now be redirected to /Admin/Moduler/Custom errors, which in turn will redirect to the above specified document id. IIS passes the requested url - that was not accessible - in an empty querystring so that it can be read in code. The following example reads the empty querystring and prints an error message. This was a very simple example, of course one could think of more advanced applications, for example performing a filter query against an EPT category - searching for the string entered after / and redirecting if anything is found.